EXCITING NEWS FROM BIBLE HISTORY DAILY: Book of Nehemiah Found Among the Scrolls. 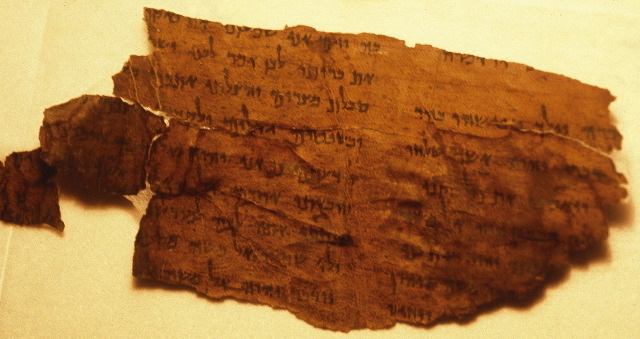 Scroll scholars find first fragment of Nehemiah. Of course readers of PaleoJudaica have known about this for nearly four years. But it's good to hear that the official publication is coming out soon. Adam McCollum, who is mentioned later in the article, is lead cataloger of Eastern Christian manuscripts at HMML and has a blog, hmmlorientalia, to which I have linked from time to time. No word on the contents of the manuscripts, but many Old Testament pseudepigrapha circulated in Armenian translations, and translations of Philo of Alexandria's works were also transmitted in an important Armenian manuscript tradition. Perhaps some of these manuscripts preserve such material. Lots of other digitization projects have been noted here and links. More on that Arabic Talmud from Arutz Sheva: Talmud in Arabic Being Sold in Jordan. A group of researchers and translators in Jordan have translated the Talmud into Arabic. Translated version sold in local book fairs. A copy has been purchased by the National Library in Jerusalem. An article on IAA supervision of the Dead Sea Scrolls in the Philadelphia exhibition: Dead Sea Scolls exhibit opens under careful scrutiny (AP). New archeological discovery: Ancient olive oil press unearthed in Modi’in. Archaeologists say the unusually well-preserved facility was active 1,400 years ago (Times of Israel). Can't make it up: Jesus Christ, now they’ve made him a video-game character (Religion World blog, Orlando Sentinel). James Charlesworth has released his much awaited report on Talpiot Tomb B and you can download it as a pdf file: What is the Message of the "Patio Tomb" in Talpiot, Jerusalem? I don't have time right now to give it the attention it deserves, but Mark Goodacre, who has been following this story much more closely than I, has some reflections: James Charlesworth on Talpiot Tomb B. The codex was the perfect version of the Bible, a sort of atomic clock of Judaism, and intended to be the model for all subsequent copies. Its early history was fraught: captured by Crusaders in the fall of Jerusalem, ransomed by the Jewish community in Cairo and consulted by the fabled sage Maimonides, it was eventually taken to the Syrian city of Aleppo. There, it resided for half a century. Although it was well-cared-for by Aleppo’s Jewish community, it had come to be revered as a relic or treasure; few were allowed to see it and no one was allowed to copy it. All that changed in 1947, when the establishment of the state of Israel by a United Nations resolution led to unrest in the Arab world and the harassment and persecution of Jewish communities in Muslim nations. In Aleppo, this took the form of riots and the sacking of the synagogue. The codex — commonly referred to as the Crown — was supposed to have been consumed in a fire set by the mob. It was not, and in 1958, the Crown was smuggled into Jerusalem by a cheese merchant who was one of the few Syrian Jews to receive official permission to emigrate to Israel. Friedman became interested in this “lonely treasure and millennium-old traveler” in 2008, when he decided to write an article about it. He imagined the piece would be “an uplifting and uncomplicated account of the rescue of a cultural artifact,” but what he discovered instead was a thicket of conflicting reports, missing records, puzzling omissions, stonewalling officials and obsessed amateur sleuths. Blessed are the cheese merchants. An editorship supervising entries on Judaism and Christianity in Classical antiquity for www.classicaltimeline.com is currently vacant and is seeking suitably qualified candidates to apply. It is expected that the prospective editor will have an academic position, a PhD, or have published research within this field. The editor can choose to devote as much time as they wish to this role, but it is anticipated that they will spend on average 2 hours a week contributing and supervising material. While they are expected to be fastidious in ensuring the reliability of the content of the timeline, it should be noted that there will be a disclaimer on the introductory screen stating that the timeline is not intended to be a substitute for more conventional sources of information on the Classical world, and that serious inquirers should continue to direct their attention to such resources. ClassicalTimeline has only been online for less than a week but has already several thousand views.This should be an exciting project to be involved in; particularly for those who wish to try and increase public knowledge on the history of Judaism and Christianity and for those interested in the expanding field of the digital humanities. For more information please visit http://www.classicalstudiesonline.org/get-involved/. JAMES CHARLESWORTH is interviewed by Ben Witherington at Professor Witherington's blog, The Bible and Culture: Dr. Jim Charlesworth on Talpiot Tomb B. These are Professor Charlesworth's views given first-hand for the first time and it is very helpful to have them. He will be posting more on his website (www.FJCO-DSS-Events.org) this week. I look forward to seeing what he has to say. Phoenicia will now retrace the ancient Phoenician-Cornish tin trade route and head towards Falmouth and finally London, arriving at St Katharine Docks on 2 June. “The Phoenicians: The Greatest Ancient Sailors” exhibition will run through to September and feature ancient artefacts from the Phoenician era. Visitors will be able to climb onboard Phoenicia for a tour of the vessel and learn more about Phoenician culture as well as the recent expedition that triumphed over Somali pirates, treacherous storms and mechanical problems to recreate one of mankind’s greatest journeys. Visit phoenicia.org.uk to purchase tickets or for more information. Phoenicia hopes to visit Gibraltar again later on in the year and offer tours to local schoolchildren. Meanwhile, Len’s grandchildren, all seven of them, are back in South Africa following the Ship’s Log and satellite tracker and keeping a scrapbook of their grandfather’s fantastic adventures. Background on Phoenicia and her epic circum-African voyage is here and links. Professor Abraham Tal is the first recipient of the newly established Gesenius-fellowship at the University of Halle-Wittenberg. Tal is the first "Wilhelm-Gesenius-Gastwissenschaftler" at the University of Halle-Wittenberg. The Gesenius fellowship and the Gesenius junior-fellowship were established by the Institute of Biblical studies at the University of Halle-Wittenberg in commemoration of Wilhelm Gesenius (1786-1842), the founder of modern Hebrew studies, who was a professor at this institute throughout his entire academic career, 1810-1842. Go here for the homepage of the "Gesenius fellowship": http://www.theologie.uni-halle.de/at/gesenius/. Earlier PaleoJudaica posts involving Professor Tal are here, here, and here.